The Australian Ballet’s 2013 production of Don Quixote opened tonight to a full and very appreciative Melbourne audience. A favourite among generations of ballet lovers, this Spanish romance is complete with rapscallions, gypsies, lovers and of course, faithful side-kicks. Unfortunately, the performance began on a rather wobbly note, and with the exception of the principals, the company seemed to have had a few clumsy moments. However, after the first interval the focus and energy were much improved and this was reflected in the excellent form and finesse of the dancers’ movements. Stand-out performances were given by Daniel Gaudiello and Lana Jones as the two young lovers, Basilio and Kitri respectively, and former principal artist Steven Heathcote in the title role. 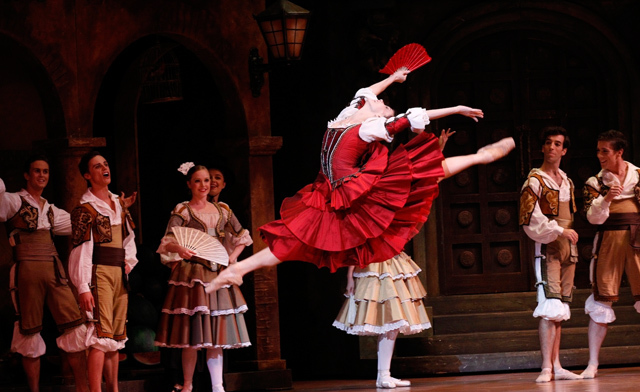 What makes Don Quixote so endearing in any ballet company’s repertoire is the vast scope for comic fun – and both Frank Leo as Sancho Panza and Matthew Donnelly as Gamache rose magnificently to the occasion. Their antics were both amusing and witty and the performance was enriched because of their nuanced character development. The scene located on the ‘Plain of Montiel’ contains one of the most sculpted and beautifully choreographed sequences in the production. Set against a spectacular stormy backdrop with a windmill as centre-piece, this is one of those exquisite aesthetic offerings when we can appreciate Anne Fraser’s stunning set designs, the variety and detail present in Barry Kay’s costumes and all to the tune of Russian composer Ludwig Minkus’ absorbing score. Among the other artists, Chengwu Guo also displays great energy and skill, noticeably as a member of the company but also as the Gypsy boy where his energy and vivaciousness make him a memorable character. Similarly, Amber Scott as Queen of the Dryads is exceptional in her solo, moving with an innate grace and sense of confident control. An excellent start to the Australian ballet’s 2013 season – and if opening night was a yardstick by which to measure then almost certainly the remainder of the season will be a resounding success.